As opposed to most romance novels, Chances Are is unique because the romantic relationships are already established for the most part, and we are entertained by how these women keep themselves together in times of turmoil. While readers are presented with tastes of romanticism, the novel is not your classic "win the man over and experience drama while doing it". Barbara Bretton's novels are great for all types of readers because they are not stereotypical in the romance genre. 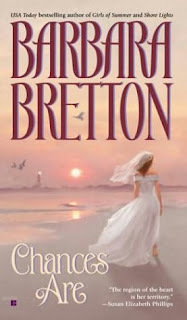 Bretton's novels give enjoyment and renewed hope for love to readers that may be overweight, widowed, divorced, sloppy, down-and-out, or past their prime in life. Being a divorced, single mother myself, I can always count on Bretton to pick me up and provide me with an awesome, fun read!